Glitch Goons, the latest mobile fighter, went live on December 1st. That says it all, but we’ll say a little bit more by revealing characters and gameplay details. Gameunculus has never been laconic, but he’s got plenty other virtues, right? 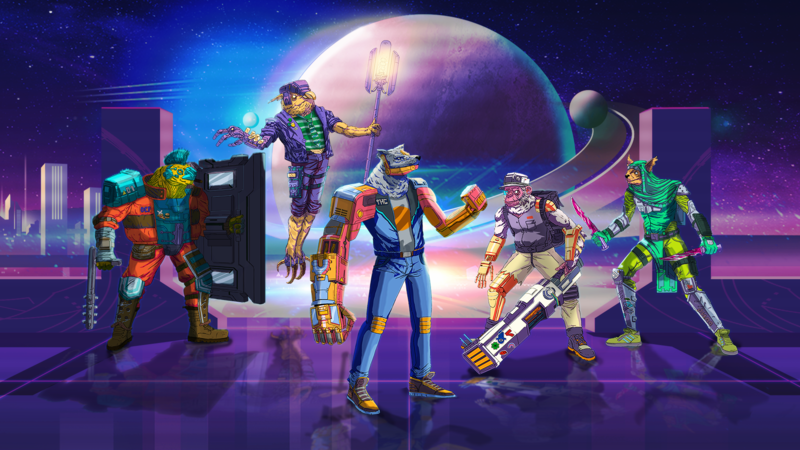 As we’ve already told you, Glitch Goons is a game where manlike animals fight for their lives. Turns out we guessed wrong when we said they’d probably be animals that became too smart and destroyed humanity. In fact, those animals are human themselves; or at least they’re carrying human minds. Why on earth would people want to transpose their minds into furry (and often smelly, to be honest) animal and bird bodies? I’ll tell you my reasons for doing it in real life, but in the Glitch Goons plot it happens because the Earth is dying out after a nuclear war, and the only chance to survive is to transfer your mind into a carrier’s body on a distant planet called Garthorix. Ugh, hard to understand! Don’t worry; in a nutshell, this game is about fighting for resources and a better life – so, same as your every day. Let’s take a closer look at the carriers you’ll need to put your mind into. There are 5 different races on Garthorix. A wolf-headed biocyborg called Aggressor (you better not come close, he’ll hit you with his cyber arm), a guy dressed in green wielding two daggers called Velorex (he’s fast and swings a venomous tail – could’ve been Velorex or Venomex, really), a huge armored tank of a reptile with a shield (or is it a door?) called Protector, a monkey-looking guy called Sapirex (smart enough to fight with weapon, not his own hands), and Levionix, a fleetly floating birdy. When starting a game, you’ll be able to choose your first character (or carrier) for free, but the others come at an additional cost. A joke about the first dose for free would be here, but we’ve already used it in another article. Well, now you can go try Glitch Goons, and don’t forget to share your honorable (not humble) opinion in our Discord and Telegram chats, or on Twitter.